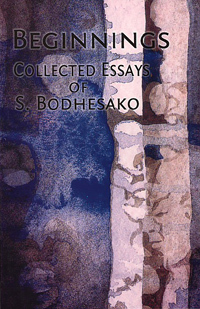 This book contains all the known published and unpublished essays by S. Bodhesako: Beginnings, Change, The Buddha and Catch-22, The Myth of Sisyphus, Faith, and Being and Craving. In the first essay, Beginnings, the author discusses the authenticity and relevance of the Buddhist Canon. The second essay, Change, investigates the concepts of change, impermanence and time in relation to experience and argues against equating them with the concept of flux or continuous change. In the third essay, The Buddha and Catch-22, the similarities between Joseph Heller's novel and the Buddha's Teaching are discussed. The next essay, The Myth of Sisyphus, is a Buddhist reinterpretation of the Greek myth of Sisyphus, which is symbolizing the endless, recurring nature of our tasks. Ven. Bodhesako also discusses Albert Camus' interpretation of this myth. The essay Faith investigates the relevance of faith in the Buddha's Teaching, while the last essay, Being and Craving, deals with the Buddhist concept of craving and its traditional interpretation. This collection will interest those who like to learn about the Buddha's Teaching from the perspective of modern Western philosophy and and literature as well as those who are interested in alternative, modern interpretations of traditional Buddhist concepts. This is an engaging and, I think, important book. Without Bodhesako we might not have access to the very important writing of the Ven. Thera.